Construction Confined Space Rules: Updated - D2000 Safety . Earlier this year OROSHA published OAR 437-002-0146 which covers general industry and construction activities. None of the changes have anything to do with how we identify, evaluate, and safely enter into confined spaces. But there are important changes to the scope of who must comply with these rules and the types of documentation they must maintain. In addition, both sets of rules changed the reclassification process. To help affected employers, on July 14th, 2015 in Medford, Oregon D2000 Safety will be offering a two-day, Confined Space Train the Trainer class. In this session we will cover all the pertinent rule changes and unveil the latest version of our entrant/attendant and entry supervisor training curricula. For those who cannot attend, here's a brief overview of the new Oregon regulations. My next post will summarize the new Federal requirements. The single biggest change in the new OROSHA regulations is that the rules now cover construction activities. Previously confined spaces were addressed in the construction rules but the definition was fairly broad and the safety requirements left largely up to the employer to figure out. For example the old rules did not require written policies, training, or rescue. 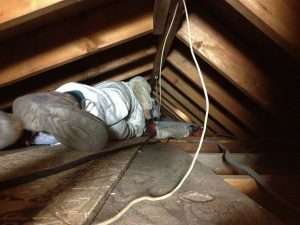 Attics and crawlspaces may become permit-required confined spaces based on the job hazards. Does it meets the definition of a confined space? Will it meed the definition of a confined space during the construction activities? What hazards might be present (including work-caused hazards) that can make the space a permit space? How can we make the confined space safe and keep it safe? What training and equipment are needed by the entrants and are they properly trained and equipped? Which other work crews might be entering this space? What work activities will they perform in the confined space? Are they trained and equipped? Documentation in the form of policies, permits, training rosters, and checklists are then needed to show compliance with this process. Again, none of this changes the ways in which we test the air or make the space safe for entry. Instead these issues primarily impact the employers' procedures and job site processes. One of the additions made by OROSHA was adding the requirement for employers to conduct awareness training for anyone working around confined spaces. The intent is to prevent accidental entry. Previously employers were merely required to prevent 'unauthorized entry' which could be done with signs or locks or whatever other means the employer felt would work best. (i) The permit space program. (ii) The entry permit system. They go on to say that office workers who walk past a manhole in the parking lot don't need this training, nor is it needed if the only way of getting into the permit spaces involves cutting off a lock and some other extreme measure. There is no mention of the need to document awareness training but it would be a good practice. Perhaps the biggest change made to the Oregon regulations relates to reclassification of permit spaces, also known as alternate entry. As a trainer and consultant I have always found it challenging to describe this process and the new rules have, shall we say, not lightened this burden. Alternate entry was intended to be used in confined spaces with only one or two hazards that can be easily controlled such as would be found in a water meter vault. By using this process employers could get out of the requirements for entry permits, entry supervisors, attendants, and a means of rescue. Under the Federal rules (29 CFR 1910.146) there are two basic methods of entering a permit space using alternate entry procedures If the only possible hazard was atmospheric, you could monitor the air and run a blower. The other option was eliminating the hazard using various means such as blanking and blinding, locking out energy, or double block and bleed. But you had to pick one of these options and if the space had both a hazardous atmosphere and another hazard such as motors that needed to be locked out you couldn't reclassify. (B) All physical hazards, if any, have been eliminated and all atmospheric hazards are controlled with continuous ventilation. OROSHA did add documentation requirements that employers who use this approach must fulfill, and they require that the entrant be provided with some means of communicating with the outside world in case they have a problem. The result, it would appear, is that they have greatly increased the types of spaces that can be entered under alternate entry procedures. My opinion is that many employers might be tempted to take this approach and send a lone worker out to lockout, drain and flush, ventilate and then enter and work within a space without the protection of a hole watch and some means of getting the worker out in the event of a mishap. But I also believe that employers who are tempted to take shortcuts are most likely already taking these shortcuts. Those are the main changes in the Oregon regulations. In a follow-up post I'll summarize the Federal rules. If you have any questions on these new regulations feel free to call us. We'll do our best to answer them.